Squirtle in game: 8,161 Who? Important notice! Pokemon Squirtle is a fictional character of humans. 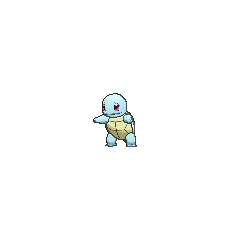 Squirtle (Japanese: ???? Zenigame) is a Water-type Pokémon introduced in Generation I. It evolves into Wartortle starting at level 16, which evolves into Blastoise starting at level 36. 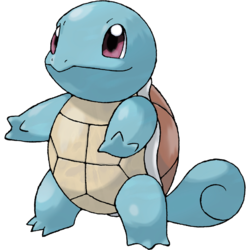 Along with Bulbasaur and Charmander, Squirtle is one of three starter Pokémon of Kanto available at the beginning of Pokémon Red, Green, Blue, FireRed, and LeafGreen. Squirtle is a small Pokémon that resembles a light blue turtle. While it typically walks on its two short legs, it has been shown to run on all fours in Super Smash Bros. Brawl. It has large brown eyes and a slightly hooked upper lip. Each of its hands and feet have three pointed digits. The end of its long tail curls inward. Its body is encased by a tough shell that forms and hardens after birth. This shell is brown on the top, pale yellow on the bottom, and has a thick white ridge between the two halves. Squirtle's shell is a useful tool. It can withdraw into the shell for protection or for sleeping, and its grooved, rounded shape helps to reduce water resistance when this Pokémon swims. Squirtle can spray foamy water from its mouth with great accuracy. In the past, Skull Bash was its signature move. Squirtle is scarce in the wild, although it can be found around small ponds and lakes. The anime has shown that it can be found living on secluded islands with other members of its evolutionary line. 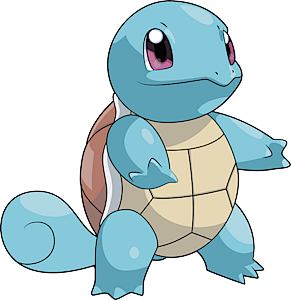 Squirtle was mentioned in the first episode of the anime, Pokémon - I Choose You!, as one of the three starter Pokémon new Trainers in Pallet Town can choose from. Ash dreamed of owning one, and it was his first choice for his starter Pokémon. However, when he arrived at Oak's lab, he found out it was too late, as another Trainer who started the same day had already taken it. It was shown battling and defeating Samurai's Metapod. It wasn't until The Ties that Bind that it was revealed that the Trainer who took Squirtle was none other than Gary Oak, Ash's rival. By then, it had already evolved into a Blastoise. The first real Squirtle appeared in Here Comes the Squirtle Squad. The Squirtle Squad were a gang of rogue Squirtle who were deserted by their Trainers. Ash befriended and captured their leader, while the rest of them became a firefighting group. Squirtle stayed with Ash until The Fire-ring Squad!, when it returned to the Squirtle Squad. The Squirtle Squad were a gang of rogue Squirtle who were deserted by their Trainers. Ash befriended and captured their leader, while the rest of them became a firefighting group. May received her own Squirtle from Professor Oak in The Right Place and the Right Mime. May's Squirtle was very young and timid, until evolving before Staging a Heroes Welcome. The main character in Pokémon Mystery Dungeon: Team Go-Getters out of the Gate! special is a Squirtle that claims that he used to be human. He joins Team Go-Getters in their rescue work. While he can't use Water Gun, he is happy to use Bubble because it looks pretty. A Squirtle appeared in Summer of Discovery!, under the ownership of Tierno. He has since evolved all the way into Blastoise. Numerous wild Squirtle appeared in Beach Blank-Out Blastoise. In Journey to the Starting Line!, a set of the three Kanto starter Pokémon in which a boy named Gilbert was supposed to choose from as his starting Pokémon were scared off by Ash's Tauros. Professor Oak, Tracey, Delia, and Gilbert had to split up and find the three missing Pokémon. Squirtle was the second one found. The Tiny Turtle Pokémon was stuck in a tree that was hanging over a cliff. Ash's Bulbasaur managed to catch the Squirtle before it could fall off the cliff. Another Squirtle was seen with Professor Oak in A Six Pack Attack! along with a Bulbasaur and Charmander. Two Squirtle appeared in Battle Aboard the St. Anne. One was under the ownership of a Gentleman while the other was under the ownership of an unnamed Trainer. In The Ultimate Test, a Squirtle was one of the Pokémon owned by the Pokémon League entrance exam instructor. 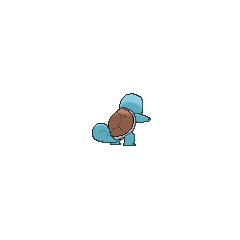 Squirtle also appeared in Pokémon Fashion Flash, The Breeding Center Secret and Dueling Heroes. A Trainer's Squirtle appeared in Friends to the End, during the closing ceremonies of the Indigo Plateau Conference. A Squirtle appeared in Marina's fantasy in Bye Bye Psyduck. A Squirtle appeared in A Better Pill to Swallow as a fantasized Pokémon. A Squirtle was used by one of the students of the Pokémon Trainer's School in Gonna Rule The School!. Another Squirtle appeared in Sticking With Who You Know!, falling in love with a Raichu. A Squirtle appeared in The Fires of a Red-Hot Reunion!. A Squirtle appeared in Alexa's magazine in The Journalist from Another Region!. A Squirtle appeared as a plush toy in A Jolting Switcheroo!. A Squirtle appeared in SM003, as a silhouette. A Trainer's Squirtle appeared in SM006. EP012 Squirtle Ash's Pokédex Squirtle. This Tiny Turtle Pokémon draws its long neck into its shell to launch incredible water attacks with amazing range and accuracy. The blasts can be quite powerful. XY039 Squirtle Serena's Pokédex Squirtle, the Tiny Turtle Pokémon. During battle, Squirtle hides in its shell that sprays water at its opponent whenever it can. Blue chose Squirtle as his starter Pokémon in File 1: Red. He later used it to battle Red's Charmander and won with ease. Sometime before Red went to the Pokémon Tower in File 2: Cubone, Squirtle evolved into Wartortle. It was shown later as a Blastoise in File 4: Charizard, when it battled against Red's fully evolved Charizard. 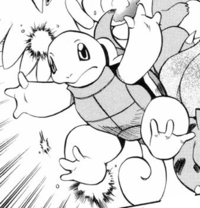 Ash's Squirtle has been featured in the manga The Electric Tale of Pikachu. It first appears in the chapter You Gotta Have Friends. Squirtle's capture is not shown in the manga, it is simply stated when it appears from its Poké Ball that "Ash has been busy since the last comic". Ash's Pikachu also meets an abandoned Squirtle in the chapter Pikachu's Excellent Adventure. This Squirtle, along with other Pokémon, helps Pikachu find the Hidden Village after he is separated from Ash and friends. 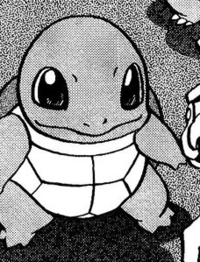 Squirtle is a supporting character in the Magical Pokémon Journey manga. He first appears in the chapter Christmas Wishes. Squirtle admires Almond and refers to him as his "big brother". Squirtle also has five sisters which appear in The Five Sisters of Squirtle. Two of his sisters are also Squirtle, twins named Kamee and Kameao. Green stole a Squirtle from Professor Oak, which she nicknamed Blasty. He has since evolved into Wartortle and then Blastoise more quickly than the others, possibly due to her innate talent in evolving Pokémon, as acknowledged by the Masked Man. Blasty is never shown in his Squirtle form, (save the contents page of the third volume and a picture Professor Oak had of Green stealing him from his lab). His first appearance, as a Wartortle, is in Wartortle Wars, returning as a Blastoise in Zap, Zap, Zapdos. A Squirtle appeared as a silhouette when Green explains about Mew in The Jynx Jinx. In They Have a Flare for a Li'l Kanga-Napping, Professor Sycamore has a Squirtle with him. Misty has a Squirtle in the Pokémon Newspaper Strip. Giovanni was revealed to have a Squirtle when he was coming up with three grand schemes. Shigeru's starter Pokémon was a Squirtle he received from his grandfather, Professor Oak. 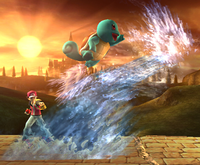 Squirtle is seen on the stage Pokéfloats and is the first Pokéfloat to appear. Play begins on its head and arms until it slowly leaves off the bottom of the screen. After traveling through all the Pokéfloats, the screen will be empty for a few seconds before Squirtle pops up and the cycle begins again. Retreating into its shell and spitting water at its foes is Squirtle's trademark response to danger. It's one of the three Pokémon that Trainers can receive from Professor Oak in Pokémon Red and Blue. Squirtle evolves into Wartortle and then Blastoise, ramping up its water powers with each evolution. Squirtle is a playable Pokémon used by the Pokémon Trainer. It can use Waterfall to recover from falls as well as Withdraw, in which case it retreats to its shell and shoots water from the back of it propelling him forwards. It also uses Water Gun to push enemies with a stream of water. Squirtle is a lightweight and uses various attacks using its shell and Water-type moves to combat its foes. It uses Hydro Pump in the Pokémon Trainer's Final Smash, Triple Finish. "A Tiny Turtle Pokémon. In times of danger, it pulls its arms and legs inside its shell to protect from enemy attacks. When it conceals its neck, it also shoots a powerful stream of water from its mouth. Its shell not only protects its body, but also reduces water friction when in the water. When leveled up, it evolves into Wartortle." Squirtle returns as a trophy in both versions of the game. NA: At the start of their Pokémon adventures, many aspiring trainers visit Professor Oak to choose one of three starter Pokémon. Squirtle's always a popular choice, what with it being so gosh-darn adorable. When it's in danger, though, it withdraws into its shell and spits a high-pressure burst of water—a bit less adorable. PAL: At the start of their Pokémon adventures, many aspiring trainers visit Professor Oak to choose one of three starter Pokémon. Squirtle's always a popular choice, what with him being so flipping adorable. When it's in danger, though, it withdraws into its shell and spits a high-pressure burst of water, which isn't quite so adorable. It takes time for the shell to form and harden after hatching. It sprays foam powerfully from its mouth. Squirtle’s shell is not merely used for protection. The shell’s rounded shape and the grooves on its surface help minimize resistance in water, enabling this Pokémon to swim at high speeds. Moves marked with a superscript game abbreviation can only be bred onto Squirtle in that game. 51%-100% HP I'll knock them out with my Water Gun! Level up Yes! Leveled up! 51%-100% HP Let's give it our best, <name>! Squirtle puffs its cheeks, then shoots water that can extinguish a small fire. It attacks by squirting water from its mouth. Squirtle came to see the Ice Tree in the Iceberg Zone, and his most loved Attraction is Empoleon's Snow Slide! He is shy, but cares about his friends. As he gains more friends, he becomes less shy. Attacks do more damage when you make a match of four. For other sprites and images, please see Squirtle images on the Bulbagarden Archives. Niue released a one-dollar coin featuring Squirtle as part of a commemorative promotion for the Pokémon franchise, with Squirtle on one side and the nation's coat of arms on the other. As a species, Squirtle has been trained most frequently of all the Kanto starter Pokémon by major anime Trainers, with Ash, May, Gary, and Tierno each owning one. Squirtle appears to be based on turtles. 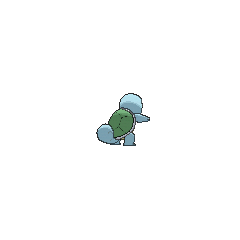 Squirtle is a combination of squirt (to spray and small child) and turtle, for its turtle-like appearance. Zenigame is the Japanese word ?? (baby pond turtle). According to Pokémon Black and White's television program PokéQuiz, "'Zeni' is an old-fashioned word for money. Squirtle's shells look like old coins, so that's how they got their name!"